The concept of the double pyramid gained in popularity at the turn of the century, with the German cognitive psychologist Hermann Ebbinghaus (1850-1909) also constructing a colour system on this basis. He rounded off the extremities, however, and inclined the central plane. The colour-solid thus formed, containing the four primary colours red, yellow, green and blue, linked an idea of Leonardo da Vinci to the realisation that the chromatic colours vary in brightness, and can thus be separately distinguished. 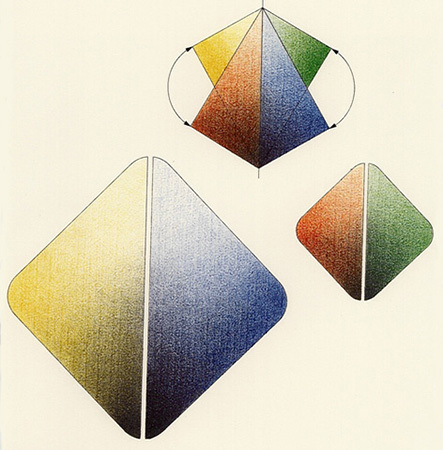 In addition to the colour-solid itself, we have included a few projections — approximately in the yellow-blue or red-green planes — in order to demonstrate the differentiation which is possible with this pyramid. The base-square of the double solid is tilted in such a way that the best yellow hues, which are relatively bright, are nearer to white, and the best blue tones, which are relatively dark, are nearer to black. Ebbinghaus rounds off the corners of his solid because the transition between the colours is not sharply defined. His system does not predict the mixtures of colours; it is a purely phenomenologically oriented portrayal of colours in which the complementary pairs do not find a place opposite one another. Ebbinghaus published a «Theory of Colour Vision» in the Zeitschrift für Psychology (Journal of Psychology) in 1893, in which he points out — amongst other things — that the perception of colours can only be accomplished with the aid of «higher mental processes». As a psychologist, he knew of the four elementary colour sensations and he also appreciated that physiologists had a valid point when they maintained that in the eye’s retina there were only three photo-sensitive substances with which to explain the phenomenon of coloured vision and its anomalies. In addition, Ebbinghaus had discovered that two white hues produced by spinning either red and green or blue and yellow colour-tops indeed appeared the same at certain levels of brightness, but appeared different when the illumination was reduced. For a long time, the Ebbinghaus double-pyramid represented the last stronghold of phenomenology, and resisted the increasing dominance of physiology and its attitude toward the nervous system. 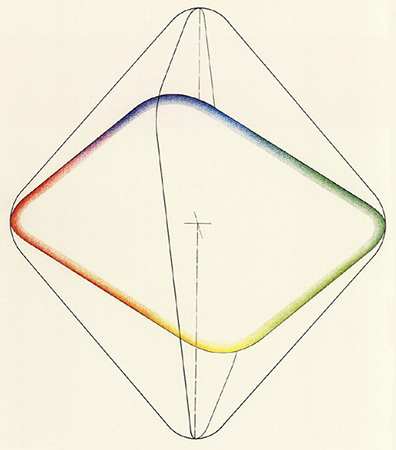 The colour-pyramid was intended to demonstrate that at least something was unconnected to both light stimulus and physiological reaction. But in the course of the following years, the phenomenologists were increasingly forced to clear the field for the experimentalists. With Ebbinghaus, an era in which colours were simple came to a close. The moment was also to come when the world of physics could no longer be quite so certain about the nature of light. About 100 years after Young’s experiments on interference between light waves seemed to have provided conclusive proof that light possessed a wave character, an exact analysis of the interaction between radiation and matter revealed the probable existence of light particles. Albert Einstein was the first to point this out — it eventually gained him the Nobel prize for physics — but at the same time he also realised that one of the great cornerstones of physics had been removed. While Einstein spoke of the duality of light, the terminology of experiments made it increasingly evident that, in order to be graphically and comprehensively understood, the properties of light had to be conceived both as a wave and as particles — so-called photons. Colours are only formed after light has interacted with (biological) matter, and we are forced to the conclusion that these very same photons enable the retina to transmit a specific colour to the brain. When it comes to colour-systems, however, we do not need to consult physics in such detail. Although the idea that waves are absorbed by the eye is sufficient for our purposes, what then unfolds within the brain is rather more complicated. Date: The German psychologist Hermann Ebbinghaus explained his ideas about colours in 1902. Bibliography: H. Ebbinghaus, «Grundzüge der Psychologie», Berlin 1902; H. Ebbinghaus, «Theorie des Farbensehens», Zeitschrift für Psychologie 5, pp. 33-54 (1893).